Godello (pronounced God-Ay-Yo) means “small indulgence”, and I for one am totally treating myself to more than one bottle of this. 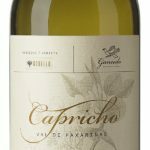 Blended with a touch of Dona Blanca grapes, I love the aromas of apricot stone, lemon pith, crushed oyster shells and white peach. Sourced from the region of Bierzo in Northwest Spain, the bursts of cheek-sucking acidity, followed by quince, almond and lime flavours on the finish, make this an absolute sensation.